My last post was about issues with the headset. I think I’ve cured that now, but onw of the symptoms was a judder under breaking. I’d assumed this was the headset suffering from the forces of breaking. However, I was reading about brake judder and it got me wondering if that was the cause of the juddering. Mounted the bike up in the work stand, removed the front wheel and cleaned both the brake track and sanded the pads down. I was putting the wheel back on, and by gently holding the brakes while spinning the wheel, I could feel a slight rubbing in a section of the track. Looking closer at the rim, there is a chunk missing, maybe couple of millimeters, and that slightly catches the pads as they contact. That, could very well be the reason I’ve got such bad judder on breaking. So I’ll fit my spare wheels for my next ride and see how they feel on the bike. Hopefully, this will be the conclusion of this drawn out saga. So, its been a little while, and a few extra miles covered on the bike. I’ve upgraded a few parts on the bike, and noticed a significant increase in performance. 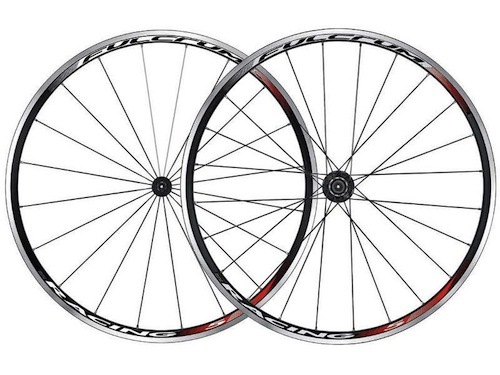 First off, after speaking to my Mechanic with a issue with the front wheel extra bearings, he recommended Racing 5 wheels from Fulcrum. The spin rate of the wheels was amazing, when spun on the work stand, they just kept on going. Riding the bike saw a vast decrease in times, with a good set of personal bests beaten. Second replacement was a new drive train, as the bike had done well over 1000 miles and the chain had stretched well past replacement. Now the times really started to fall, on almost each ride, I noticed how much less power I was having to put down to get the same forward motion, and how easy they coasted. The best ride was out to Wetherby, a fast route once your past Rudding hill. 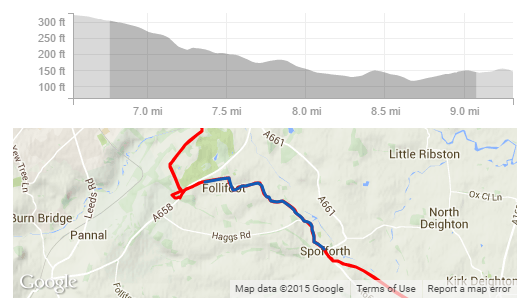 This Section, from Folifoot to Spofforth saw me have an average speed of 22mph, topping out at 31mph. And I wasn’t really trying there. But the bike just zipped along. Some of this is without doubt, due to improved fitness, but alot is down to the wheels. They are simply the best upgrade you can make to a bike to improve its speed. Especially over stock factory wheels. So, if your wanting to upgrade your performance, replace those slow factory wheels with a better solution.